Enhance your Old Apple Mac Pro / Windows PC upto 10X Faster then USB 2.0. 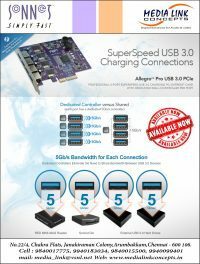 Add Sonnet Allegro 4 Port USB.3.0 PCIe Cards to any old System and Connect Bus Power Hard Drive,SSD,DVD & Blu-Ray Devices to get High data transfer rate upto 5Gbps. Make Your Old System Faster Now ( Apple / PC ) With Sonnet USB 3.0 PCIe Card.